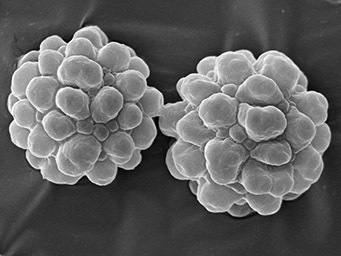 Ascospores: globose, inclusive ornamentation 19-24(-25) µm, exclusive ornamentation 15-20 µm in diameter, ornamentation consisting of rounded tubercles 3-6 µm wide and (1-)2-3(-5) µm high, partly confluent, with internal guttules therefore appearing "foamy"
Host: Archidium alternifolium, possibly also Fossombronia spec. 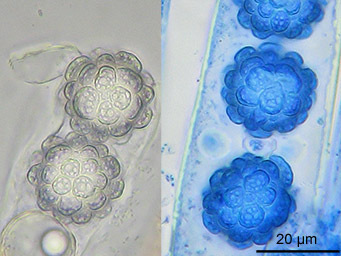 Note: The large, globose ascospores ornamented by tubercles with internal guttules are unique within the bryoparasitic Pezizales. Aeberhard, H. 2010. Ein seltener Moosling (Lamprospora maireana). - SZP/BSM 88/2010: 222-224. Kullmann, B. 1997. 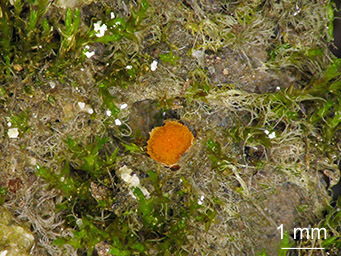 A very rare discomycete, Octospora maireana, found in Finland. - Karstenia 37: 27-31. Ortega, A. & Buendia, A. G. 1987. Contribucion al estudio de la tribu Aleurieae Seaver emend. Korf en la peninsula Iberica. 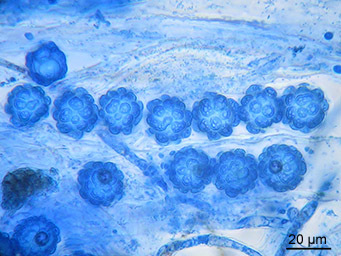 - Cryptogamie, Mycologie 8: 125-140.